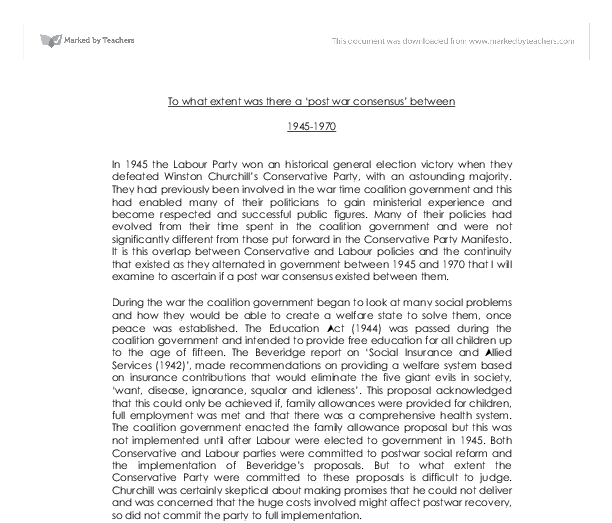 To what extent was there a 'post war consensus' between 1945-1970. 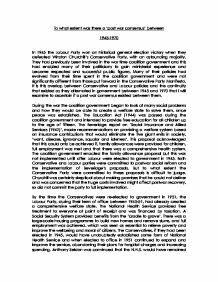 To what extent was there a 'post war consensus' between 1945-1970 In 1945 the Labour Party won an historical general election victory when they defeated Winston Churchill's Conservative Party, with an astounding majority. They had previously been involved in the war time coalition government and this had enabled many of their politicians to gain ministerial experience and become respected and successful public figures. Many of their policies had evolved from their time spent in the coalition government and were not significantly different from those put forward in the Conservative Party Manifesto. It is this overlap between Conservative and Labour policies and the continuity that existed as they alternated in government between 1945 and 1970 that I will examine to ascertain if a post war consensus existed between them. During the war the coalition government began to look at many social problems and how they would be able to create a welfare state to solve them, once peace was established. The Education Act (1944) was passed during the coalition government and intended to provide free education for all children up to the age of fifteen. The Beveridge report on 'Social Insurance and Allied Services (1942)', made recommendations on providing a welfare system based on insurance contributions that would eliminate the five giant evils in society, 'want, disease, ignorance, squalor and idleness'. This proposal acknowledged that this could only be achieved if, family allowances were provided for children, full employment was met and that there was a comprehensive health system. ...read more. Every government's foreign policies, with the exception of Heath's, were pro-American and without European allies were of paramount importance for the protection and safety of this country. Britain also began a programme of decolonisation, with India being granted independence in 1947 and eventually the British Empire was transformed into a multiracial Commonwealth with a series of naval and military bases maintained for the protection of Britain's global interests. Churchill continued Labour's policy of gradual retreat by withdrawing the military presence in Egypt and by the late 1970s the empire had been completely dismantled and the Commonwealth had little influence on Britain's world standing or future. Bevin the Foreign Secretary in the 1945-51 Labour government thought that maintaining a large conventional military force and building atomic bombs were essential to maintaining the perception that Britain was still a great power. Defense expenditure remained at a high level throughout Attlee's government and per capita was greater than the United States. The Conservative government followed Labour's lead and Britain's nuclear capacity was increased with the development of the hydrogen bomb after 1954. By 1960 Britain had cancelled their order for the surface-to-surface missile and no longer maintained independent nuclear power and from 1962 became totally dependent on the United States for its nuclear weapons. European integration was ignored because of the stability gained from Britain's relationship with the United States, and the immense trade from the British Empire, enabled them to remain aloof. ...read more. Political ideas began to shift towards the right of the Conservative Party and the left of the Labour Party. With Labour wanting additional nationalisation and state control of industries and the Conservatives wanting tax cuts and a Welfare Service only for the neediest, huge differences in policies and opinions began to emerge. The two main parties, Labour and Conservative, would not agree that there was a general consensus because the opposition party were only elected if they could convince the electorate that they were offering better policies. But they did have a lot of common ground, including maintaining high levels of employment, the provision of a welfare state and a mixed economy with both public and private enterprise. Some of the continuity was inevitable as middle ground politicians led both parties, and because when a new government were elected they inherited any debts and problems that the previous government had had and this restricted and constrained their own policies. New policies could only be implemented if the political, diplomatic, economic, social and even world conditions were favourable. Sometimes it was necessary to postpone or abandon policies because of a prevailing climate, for example lack of finance. Policy details and the aims of the parties always differed profoundly, and the extremists within both parties were irreconcilable. This consensus was not complete or absolute but the fundamental continuity that the two alternating powers provided and the undisputed continuation of many policies makes me believe that there was an underlying consensus. ...read more. During the post war concensus the relationship between government and unions was close. Thatchers 'new right' however was hostile towards trade unions. The hostility was due to three main factors. There was an element of fear of the unions. This reached fever pitch when the miners strike of 1974 led to the downfall of the health government. Northumberland did not use proclamations half as much as Somerset, recognition of his desire to work with others. This proves that his ability as an able politician and governor enabled him to be more successful at dealing with current issues at the time than Somerset. Why Did the Post-war Consensus Breakdown? It meant that for the first time, every British citizen would be able to get free medical treatment. This meant the existing system needed to be changed. All hospitals were brought under state control (nationalised). The changes took over two years to complete. What was the post war 'consensus'? The Conservative party has always had its traditional views on policymaking and to a certain degree its ideas were quite different to that of labours especially in areas such as Nationalisation which the Conservatives are strongly against. However to this, post war conservative leaders complied passively and without protest to Labour ideology. 1925 - Old age Pensions Act increased the contributions given by national insurance to bridge gap for the retiring age of 70. These were the main changes introduced between the wars. This shows that the government were taking a greater responsibility for social welfare. The emotional response to ordinary peoples' welfare and the exposure of the hard realities of life increased concern among the Government and the Beveridge committee. It is clear that Beveridge's views made a widespread contribution to the creation of the welfare state but the report went much further than just Beveridge. What he embodied was a figure that united people. If it were not for his leadership skills, preaching and actions in resisting the British, then Indian self-rule may well not have been achieved. He showed what could be achieved by application of commitment and determination. This means that all his political measures were for the benefit of the people and not for his personal gain or personal interest. Gash often claims that it was the lack of party loyally that split the conservative party in 1846 not that of peels himself.